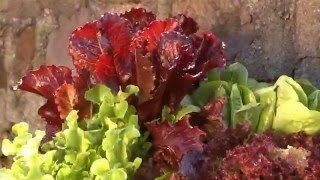 Feast both your eyes and your palate on lettuces that thrive in the heat and remain productive and tasty longer than all others. Our choice"slow bolt" varieties include green and red crisphead, green romaine and multiple textures and colors of looseleaf. Lettuce, Heatwave Blend is rated 4.2 out of 5 by 39. Rated 1 out of 5 by Gingerbreadfarm from Waste of money unless..... Unless you can tolerate bitter don’t bother. I thought it was supposed to be milder in hot weather. It was bitter before hot weather arrived. Rated 5 out of 5 by Kathy1 from Promises delivered We had a rough cold spring in KY so my seed got a slow start but once it went from Winter to SUMMER in two weeks, these really took off. I have so much lettuce that I gave it away in gallon bags. My family can't possibly eat all of it. 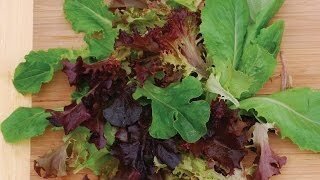 It is a tender, flavorful lettuce mix that has a great variety of textures. Some of the varieties have bolted now (its late June) so I'll buy another packet, turn these over, and start over. Rated 5 out of 5 by mrsgibby from Easy and delicious This year is my first time growing lettuce. I ordered the heatwave blend since I am in hot & humid VA and got my garden in late this spring. This lettuce grew quickly (so quickly none of my other vegetables are ready to harvest yet), and I have continuously had lettuce for salads for a couple weeks so far. It is growing great in all varieties and tastes awesome! In reading other reviews, I'm confident we'll have great lettuce throughout the summer and fall! Rated 5 out of 5 by Eandrusk from Best Edible in my Garden last Summer I read a bunch of hipsters like to grow things in broken furniture pieces on their city rooftops. Being a frugal-minded and eco-conscious, I figured I’d give it a go. This Heatwave Blend didn’t disappoint, but don’t let the name fool you: this grows just as well in cool weather. I never thought I could grow food in my tiny city balcony garden but now that I have I’m a believer. Every couple days to a week, all I’d do is trim off a bit of lettuce for a salad and share with my roommates. The next week it was back again and no need to buy again. Didn’t even use all the seed. Finally got some use out of the ol’ salad spinner. I suppose I need to learn how to cut the lettuce such that I get all of it up (you can see in the photo some of the spillover which if left can spoil), but I had no problems with critters or bugs with this planted in a container off my balcony railing (next to a David Austin, squash, and another red tea rose bush. It kept growing all summer and through the fall until the first snow in November. Who says you cans garden in containers? Something so satisfying about growing your own food and I hope more city dwellers will try it! Rated 5 out of 5 by Black Hills from Great blend for hot weather I love growing this every year. My garden gets ZERO shade, so I need a lettuce that tolerates the heat. I sow this variety three times; as soon as it starts to bolt, it goes into the compost bins and I start a new batch. Pick it at night or first thing in the morning (morning is best) and it will never be bitter. Rated 5 out of 5 by John B from Late summer treat First time I’ve ever had success with a late summer lettuce . Heat Wave is wonderful producer and great flavor. We’ve had an extra 4-5 weeks of salad lettuce since planted in early August. I’ll absolutely do the same next year. John in SW Pa. Rated 5 out of 5 by oldgeezer from Fast growing Harvested my first salad only 38 days after sowing seed. Tender and delicious when leaves are 6-8 inches. Rated 1 out of 5 by BernieB from Disappointing I bought three different lettuce seeds for fall planting here in coastal South Carolina. I have done this for years. None of the seeds germinated in any of the varieties. I don't usually buy Burpee seeds and probably will not again.